The financial markets are entering an interesting phase of their lives this year. The stock markets hit their all-time highs while U.S. Note yields after multi-year super lows have re-emerged from dust breaking its downward trend. The 10-year U.S. note yield hit almost a four-year high last week. The rate is still in very low levels and should not pose a threat to the stock market since investors still prefer equities, however, a continuous trend in future will definitely result in a change of the current environment. Still and all, let’s focus on last week market review. While the investors are hopping between the powerful corporate fundamentals and worry of rising interest rates, the stock market is forming its consolidation phase. The volatility has decreased last week, although we shall not perhaps get used to it. 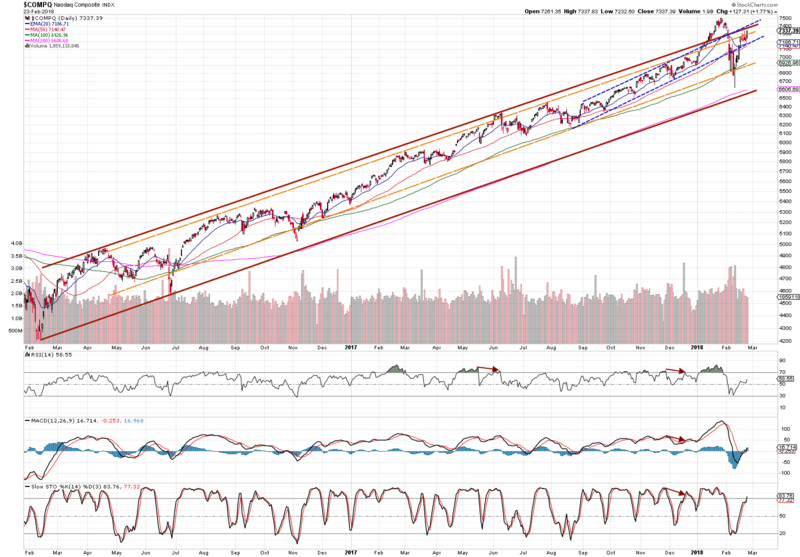 Even though major indexes are nicely placed within their trend channels, the higher volatility levels may spark higher swings in upcoming weeks. An index bounced from the inner trend line (orange dashed line) that is considered as prevalent support and broke through 20 and 50 moving averages. 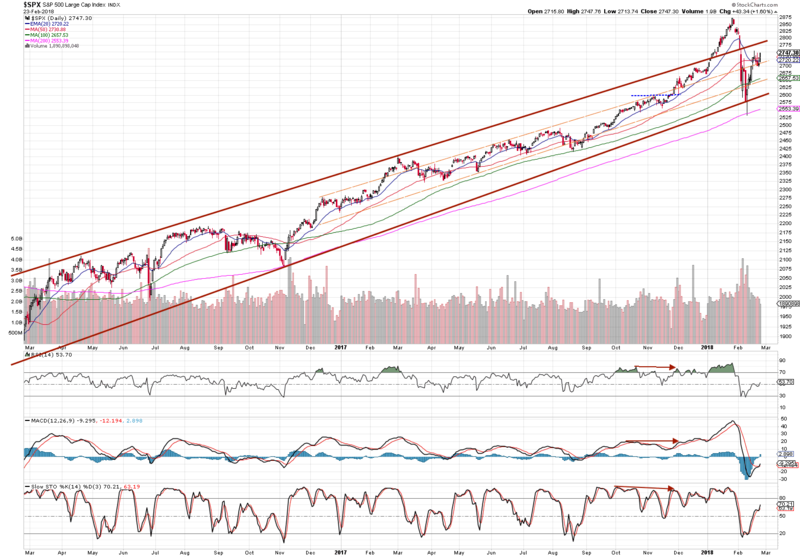 Currently, the market is trending higher, the nearest resistance to watch is an outer trend line (wide red line). 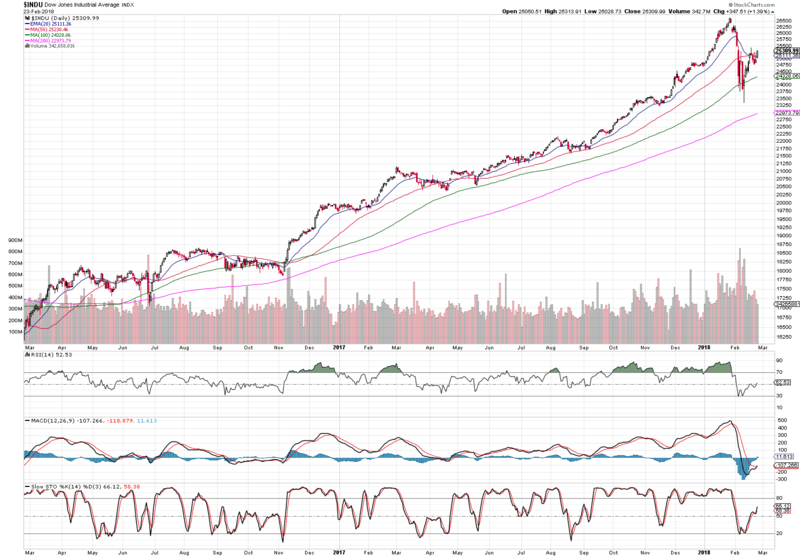 It is very hard to determine trend line analysis on Dow since this market is super tight to moving averages. It is consolidation around 20 EMA and 50 SMA. The 20 EMA should cross back the 50 SMA to give a signal of a returned bullish trend. Its support is still 100 MA. Tech-heavy Nasdaq looks the best for investing at the moment. The index broke through the inner resistance (orange dashed line) and it’s approaching the outer resistance (wide red line). It would be very interesting if it follows its short-term trend channel (blue dashed lines), while it is unlikely with higher volatility. The UK Index is struggling to get above the resistance. It is also deep down under its 200 moving average. The long-term trend was recently broken twice. This index is losing its trend. Further consolidation is needed to get a clearer picture of the market. The current market review suggests an optimistic view on the US indexes and a neutral view on the UK index. Until next market review let’s stay disciplined and focused on big picture. The trend will show a direction of future paths.